Free shipping. Buy direct from HP. See customer reviews and comparisons for the HP USB-C Dock. Upgrades and savings on select products. 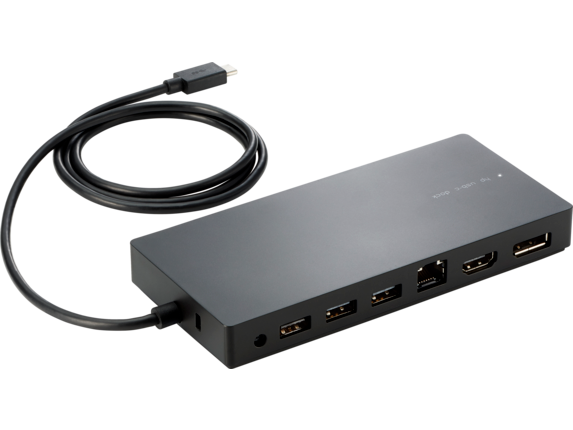 Connect your laptop to Ethernet, HDMI, DisplayPort, USB-C™ , and four USB ports. Quickly connect your laptop using the single cable for productivity when you need it. An HDMI and DisplayPort let you power two displays at once. Its small design easily fits into your workspace without adding unnecessary clutter. 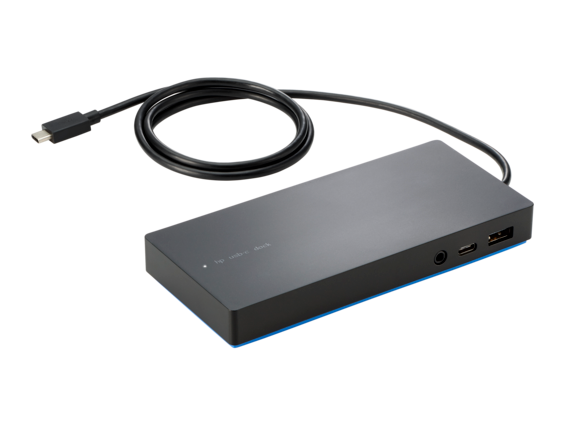 Connect your laptop to Ethernet, HDMI, DisplayPort, USB-C™, and four USB ports. 1 HP includes a one-year limited warranty with online support. Internet access required and not included. Consult the HP Customer Support Center for details, or go to www.hp.com/go/orderdocuments. Actual product may vary from image shown. 2 USB-C™ is a trademark of USB Implementers Fórum. When it comes to using a laptop with peripherals, connectivity isn’t always easy. We’ve all been there: you’re at your desk, ready to dive into that next project, but first you have to connect a monitor, an Ethernet cable, a keyboard, and an external drive. It’s a cumbersome way to start the day, to say the least, but what if there was a way to simplify this process? Now there is thanks to the HP USB-C dock, which allows you to connect to all of your favorite peripherals with a single connection. The HP USB-C docking station was designed to speed up and streamline the way you approach work. It does this by letting you connect to all the devices you use every day with just one cable. All you need to do is plug it in to receive instant access to your connected monitors, external storage, headphones or speakers, and wired networks - all while powering your laptop. The HP USB docking station has more than enough capacity to provide easy access to all of your peripherals. There’s no skimping on options here, because it includes ports for HDMI, DisplayPort™, USB-C™, USB-3.0, and even your headphones/speakers. This large number of options opens up the possibilities of what your notebook can do, giving you the power to take on tasks in more ways while also reducing clutter. After all, who doesn’t want a cleaner desk at work? Using the HP USB-C dock gives you a simple way to eliminate all the cables that normally clutter your workstation. Instead of connecting each device to your laptop one at a time with wires running out either side of it, you can connect everything to your dock and tuck it out of the way. Then you only have to deal with a single cable when it’s time to get work done. What’s better than seeing your work on an external display? How about seeing it on up to two external displays? That’s just what you can do when you take advantage of the HDMI and DisplayPort channels found in the HP USB-C. Each port supports up to 4K, too, so you can get the most out of your laptop and your existing monitor setup. The best part of using a laptop is the mobility it gives your workflow with the option to start a project in one place, close the lid, go somewhere else, and pick right back up without missing a beat. Often, the only downside comes from not having a full range of accessory support when you want to buckle down and take on the big stuff. We made the HP USB-C dock to bridge that gap. With a single connection point, it’s easy to dock your laptop when you’re at your desk so you can take advantage of all your familiar accessories. When it’s time to go, just disconnect one cable and slide your laptop into your bag. That gives you the power to streamline the way you work from on-the-go to in the office to anywhere else your work takes you. As spacious as some laptop hard drives may be, many are often still limited in terms of how much they can hold due to size constraints. And when it comes to getting the most out of your workspace, we all know that more is better. That’s why the HP USB-C docking station comes with 3 USB 3.0 ports that empower you to expand your storage as far as you want to take it. Connect up to three external hard drives at once for an ideal way to access large files, backup your device, and store creative assets. We also know that you sometimes need local network access or a more reliable connection than WiFi offers. That’s why this USB-C dock includes an Ethernet port so you can enjoy the higher speeds from a hard connection. Simply connect your Ethernet cable and you’ll instantly have access to your wired network and all of its connected devices every time you connect your dock to your laptop.